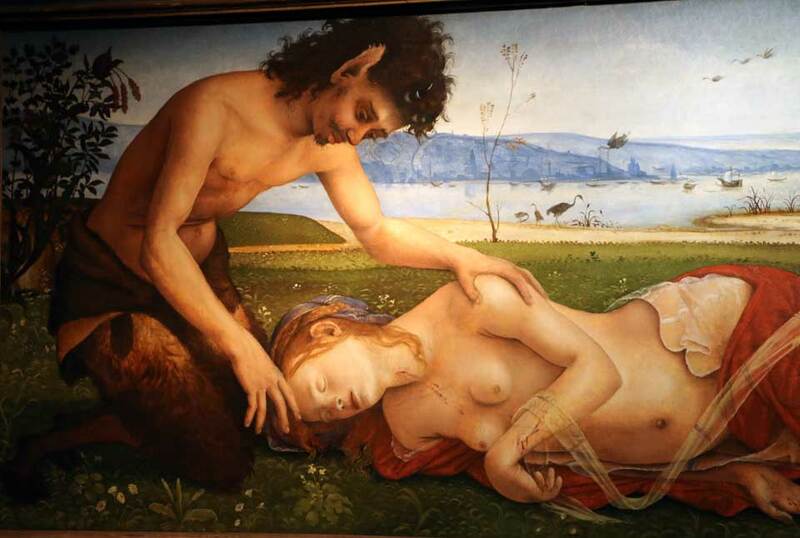 Visitors coming to visit the Uffizi Gallery over this next week will be seeing several “works in progress” as the museum prepares to close down the Botticelli Rooms (Halls 10-14) for renovation as part of the New Uffizi project. From July 14th, 2015 Halls 10-14 will be CLOSED, with planned reopening in the Spring of 2016. 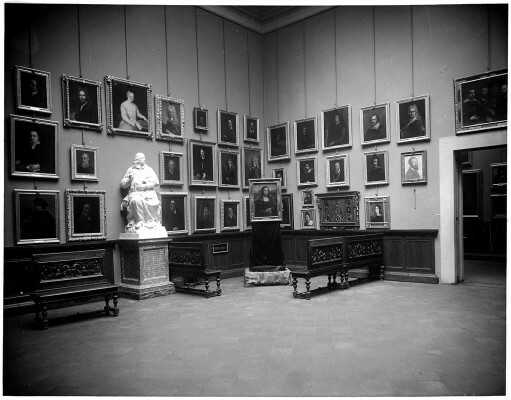 Some of the smaller paintings housed in these rooms have already been removed between the night of July 5th and Monday, July 6th, during the museum’s closed hours. Throughout the week, some of the smaller paintings will make their way to Hall 41 which will house the most famous Botticelli paintings while restoration of the rooms is underway. 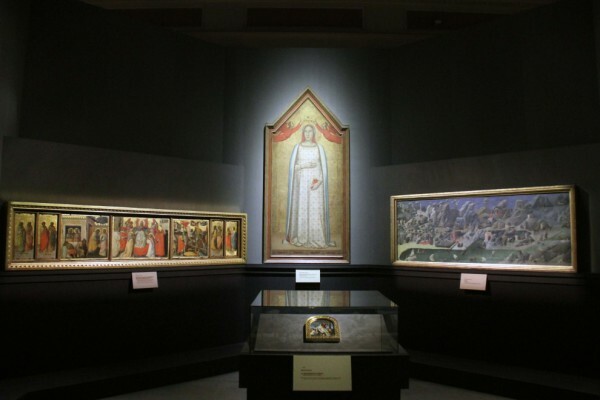 Hall 41 itself has been restored and prepared for the move to house, among others, Botticelli’s Spring and Birth of Venus, thanks to support from Friends of Florence, a non-profit organization. Within the same room, Hugo van der Goes’s Portinari Tryptych will also be on display in this room. Within the museum’s new exposition, this hall will eventually host 15th century paintings from Northern Europe. 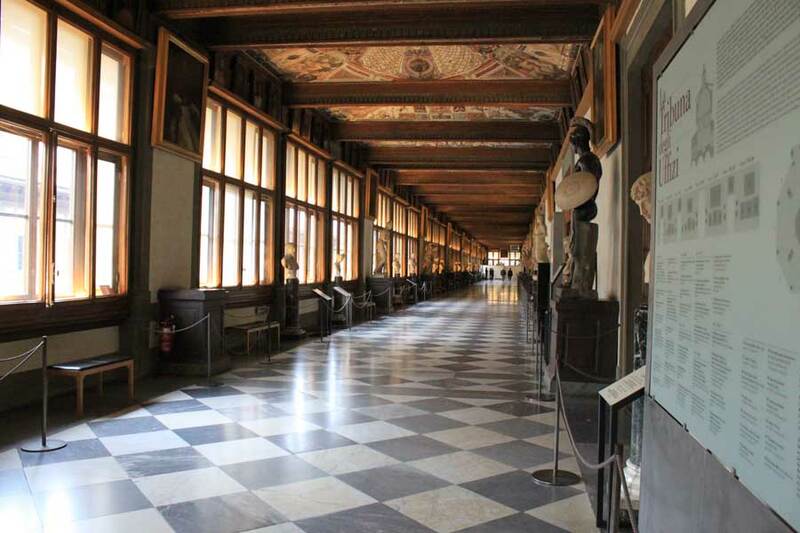 Starting June 27th and through December 19th, the Uffizi Gallery will have longer opening hours every Saturday. The museum will remain open until 11pm. Ticket office will close at 10:05pm. There will be no longer opening hours on December 12th. 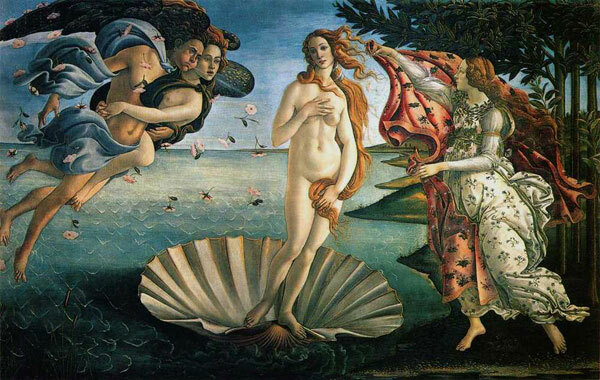 Starting July 7th until September 29th, the Uffizi Gallery will also remain open every Tuesday until 10pm. Last entrance you can book online is at 8pm. Take advantage of the longer opening hours to go visit the Uffizi in the late afternoon, early evening when the crowds are generally reduced! Take your time to enjoy the latest current temporary exhibition, too! 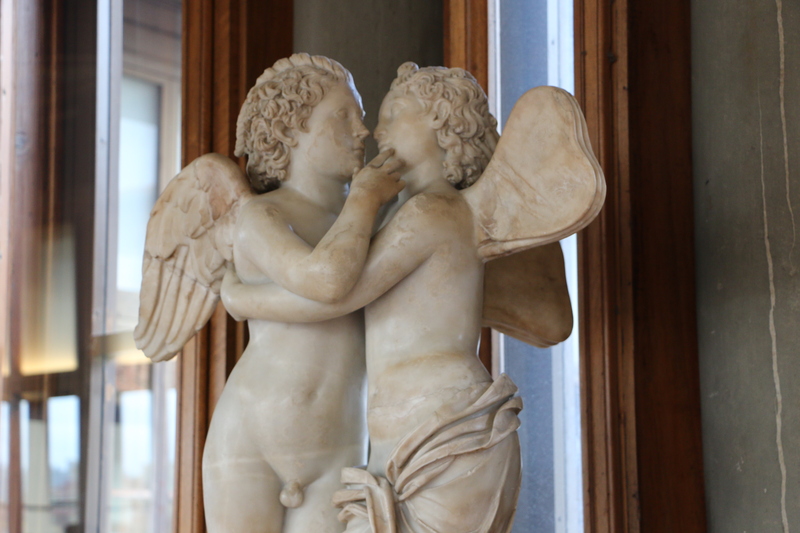 The Contini Bonacossi Collection at the Uffizi Gallery is not normally open for visits. Take advantage right now that the museum is offering free guided visits from now until June 3. Visits are offered only on Wednesday afternoons at 2:30pm and at 4:15pm. Groups will be up to a maximum of 15 visitors – you need to reserve your spot by calling 055-2388693 from Tuesday and Saturday between 2:30 and 4:30pm. Meeting point is under the Loggiato of the Uffizi at Gate 1 (prebooked tickets) 20 minutes before the start of the visit. Visitors will have to go through the metal detectors, then will be accompanied up the stairs to enter into the Collection directly. A visit to the rest of the Uffizi Gallery is not included. UPDATE May 12: Two more visits have been added on Wednesday mornings given request, at 9am and 11am. The collection will remain open until June 3. 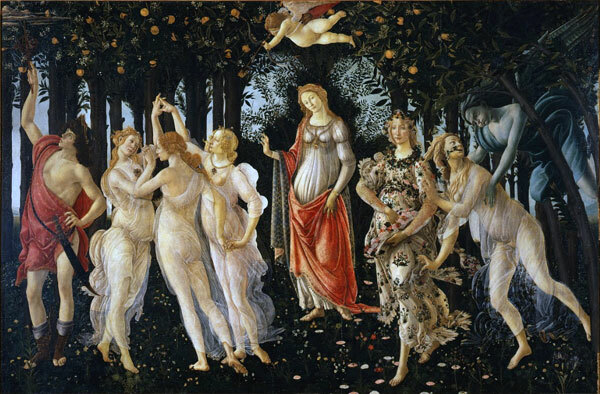 This year, the Uffizi Gallery will NOT have a special opening on the evening of April 30th as part of the city’s “White Night” program nor will it be open on May 1st. There was no agreement between the employee unions to have enough staff to open the museum for the times that were necessary for the museum to be open. The museum will remain open on April 30th until normal closing times, which is 18.50. If you’re in Florence on April 30th and May 1, take a look at this post which has a list of museums that will be open for the White Night and on May 1st. The museum is open on May 2nd and 3rd; on May 3rd entrance will be free for everyone as part of Italy’s “First Sunday of the Month” cultural initiative offering free entrance to all State museums. 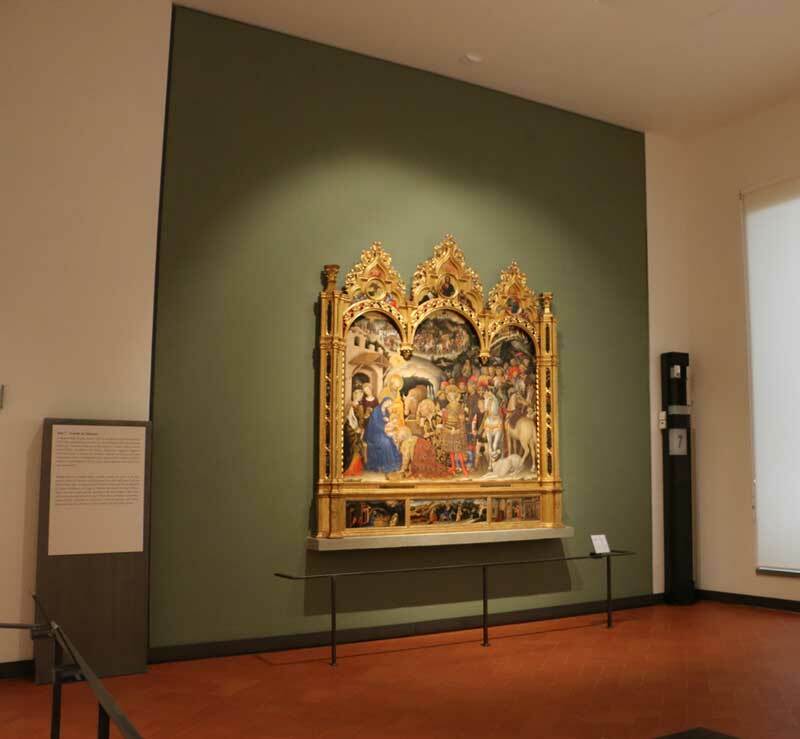 Yesterday, halls 2 – 7 which house 13th to 14th century Italian works of art reopened after 9 months of renovation works. 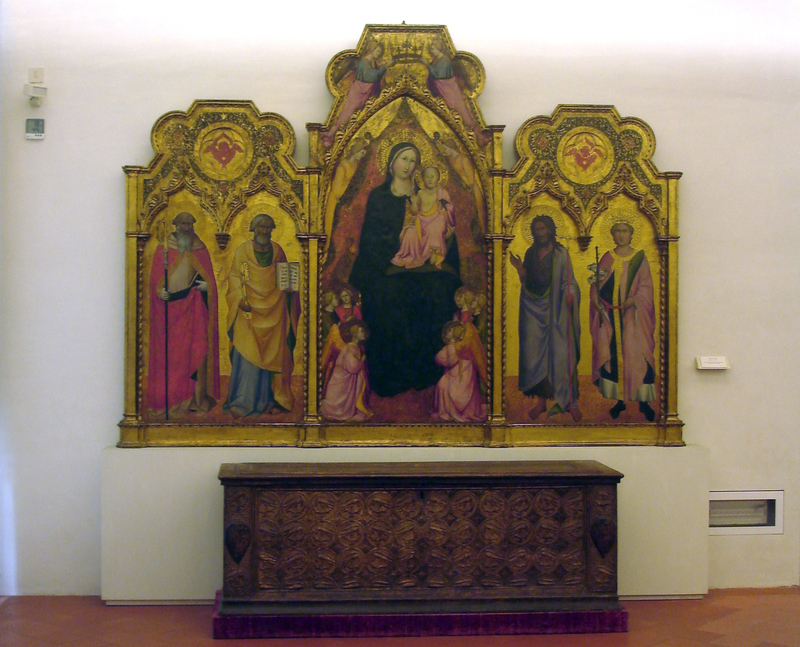 The work that was carried out in these 6 rooms has been extraordinary, including the fact that the 3 “majesties” housed in hall 2 by Giotto, Cimabue and Duccio da Buoninsegna and Monaco’s Incoronation remained in the halls (due to their massive size) but with a special protective box especially constructed around them this entire time. 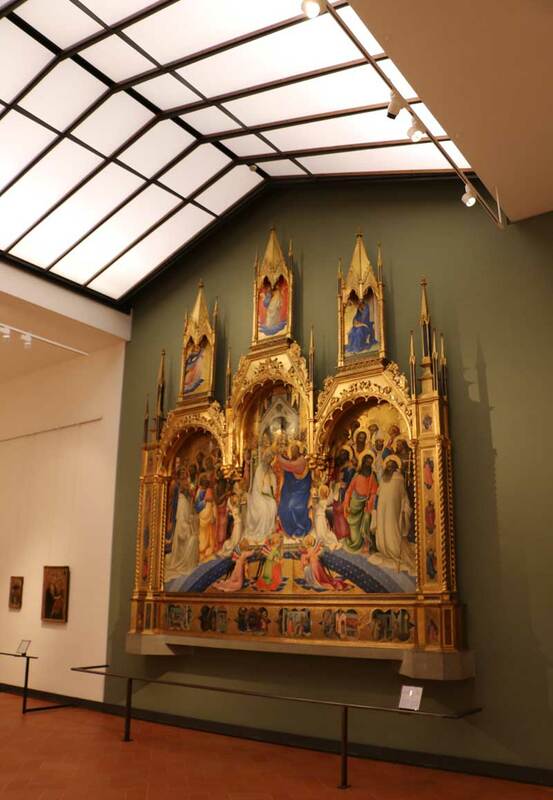 During these months of intense labor as the New Uffizi project proceeds, the halls received new lighting, both natural and artificial, and new air systems. The artworks have been better distributed to allow for a better reading and enjoyment of the works. 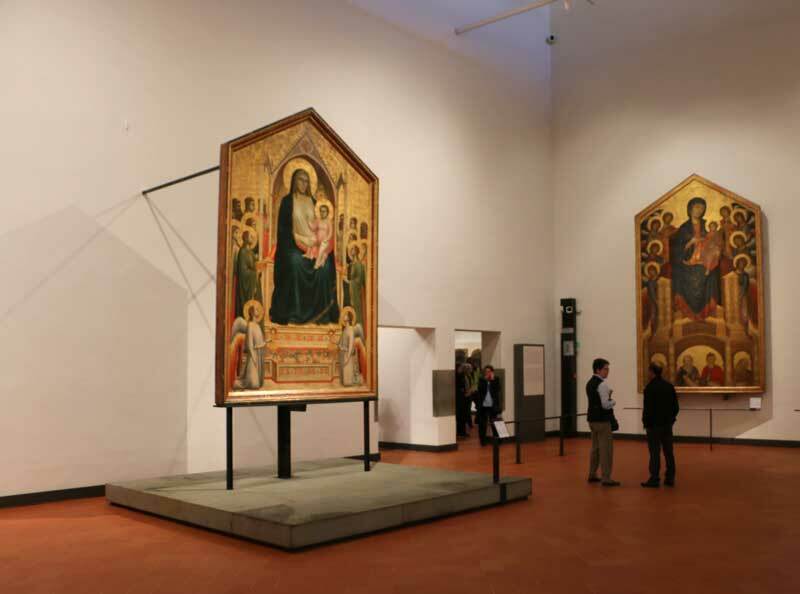 With the reopening of Hall 1 last year, several works from Hall 2 had been moved to that new hall and this allowed the integration of a total of 14 “new” works in these rooms, coming from other Florentine museums and from the Uffizi’s own deposits. This includes the marvelous Madonna of Humility by Nicola di Guardiagrele at the top of this post, the only work known by this artist. The new hall 6 dedicated to Lorenzo di Monaco. Chief among the new elements visitors will find in the new rooms is that Hall 6 which was devoted to International Gothic art has now been divided into two rooms, Hall 6 now being devoted entirely to Lorenzo Monaco and Hall 7 now hosting Gentile da Fabriano and International Gothic where you can enjoy Gentile’s Adoration of the Magi set against a green background, the color chosen to represent the 15th century. 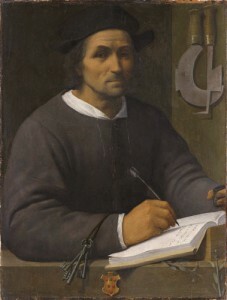 The new hall 7 dedicated to Gentile da Fabriano. The information on all of the new halls will soon be updated, in the meantime we hope visitors will enjoy the new rooms and the chance to admire some of the greatest works of art from the 13th-14th centuries. The Uffizi Gallery will be open on Easter Sunday, April 5th, with its regular hours (8.15am-6.50pm) and with FREE entrance to everyone (as it is the first Sunday of the month). It will also have a special opening on Monday, April 6th, again with normal hours but with paid entrance. You can pre-book tickets for Monday online, but not for Sunday. 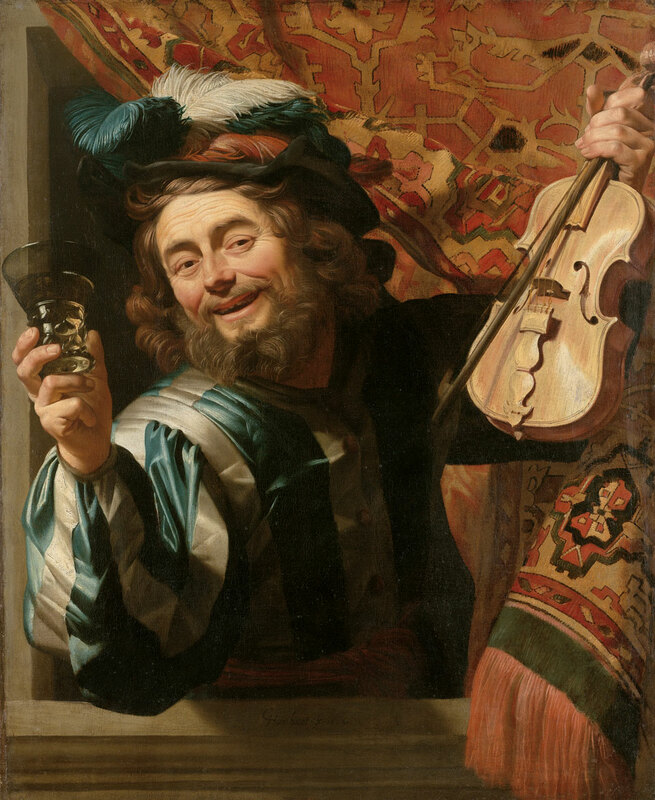 We remind you that there is a temporary exhibit dedicated Gerrit van Honthorst currently at the Uffizi – we highly recommend you make time to stop by and see it. The first mono-graphic exhibition dedicated to Gerrit van Honthorst, also known as Gherardo delle Notti in Italian, has opened at the Uffizi Gallery. The exhibit is part of your admission ticket, so make sure to stop and visit!! It is a great exhibit that brings works from across Italy and the world – from the National Gallery in London, the Staatliche Museen in Berlin, the Hermitage of St. Petersburg, the Alte Pinakothek in Munich, the Rijksmuseum in Amsterdam, the Ashmolean Museum in Oxford, the Cleveland Museum of Art, the Los Angeles County Museum of Art and the Minneapolis Institute of Arts. Together with the 4 works by Gherardo at the Uffizi, this is a unique opportunity to see works by the great Dutch Caravaggio. See the full details on the exhibit here. Following the Ministerial decree from July 2014, many State museums in Italy are part of the “Sunday at the Museum” initiative and this means that the first Sunday of the month entrance is free for everyone. For the first few months, the Uffizi Gallery allowed the pre-booking of tickets online for these dates, but by November 2014, it was decided it was no longer going to do so, as it created a two-tier level of entrance on dates when everyone was to enter equally. This now means everyone has to stand in line to get a chance to visit the museum on this day. Expect long lines, given the popularity of visiting the museum on this day by both locals and visitors alike. This means you cannot book the first Sunday of the month online AT ANY of the online ticket websites and it will seem as if the date is blocked out as it is for Mondays, when the museum is closed. If you’re in Florence on this day of the month and you want to absolutely visit the Uffizi, we suggest arriving early but to also be prepared to be extra patient with long lines. To follow and maintain security protocol, the museum will only allow entrance up to a certain number of visitors; you have to wait for museum visitors to exit before more visitors are allowed inside. As all of the city’s State and civic museums are free on that day, we suggest the option of visiting any of these other museums on that day and visiting the Uffizi on another when it likely won’t be as crowded. Read more details on these additional museums here. 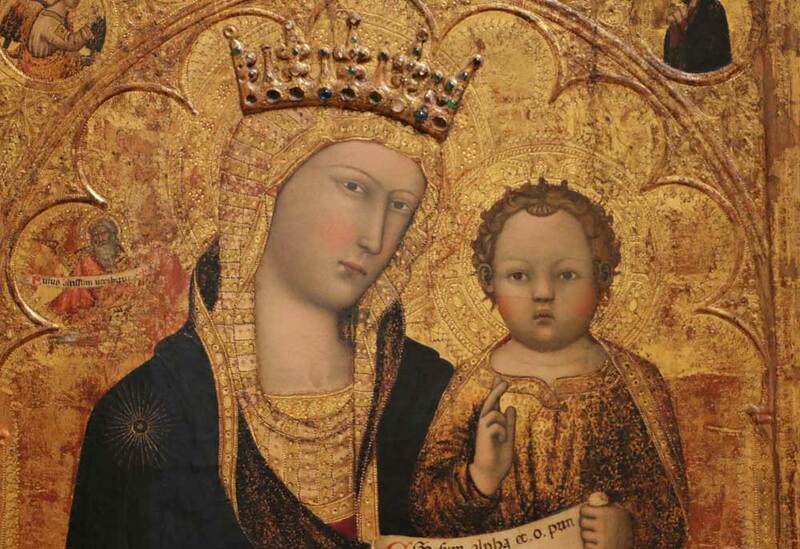 Inaugurated on December 20, the 14th edition of “I mai visti” (or “Never Seen Before”) called “The Collection of Russian Icons at the Uffizi” will be open until February 1st, 2015 at the Reali Poste space at the Uffizi Gallery. The collection includes about 70 works that belong to the Florentine museum since at least 1761, when they were already a part of the collections of the Grand Duchy of Tuscany, then led by the Lorraines of Austria. 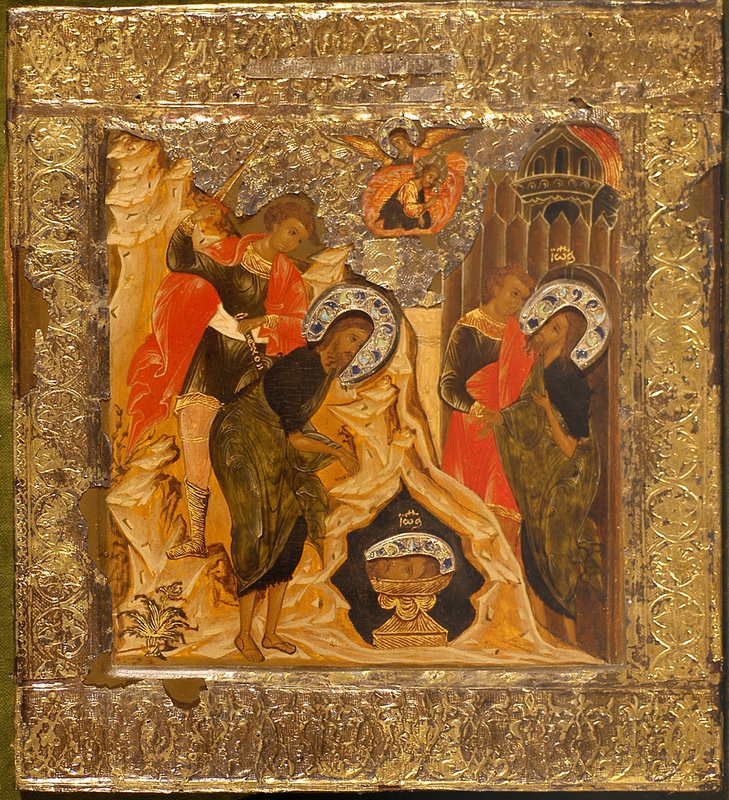 These are at the heart of the oldest Russian icon collection that exists outside of the Orthodox world. Of various formats and iconographies, the icons were created in Russian workshops and in other important centers of Russia, between the end of the 16th century and the first decades of the 18th century. Starting January 7th, the exhibit at the Reali Poste will also be offering free guided visits every Wednesday afternoon at 2:30pm and 3:45pm and every Thursday morning at 10:15am and 11:30am. The exhibit is also organizing workshops for children (ages 5-10) on January 3, 10, 17, 24 and 31, 2015, starting at 10:30am connected to the exhibit. Participation is free, but it does need to be booked ahead of time by emailing: cristinabonavia@gmail.com. Professional guides from the Associazione Mercurio are organizing the “Gift of Restoration” initiative in the form of guided visits before the 7th of January. Visits are offered Saturday and Sunday December 27th and 28th and January 4th and 6th 2015 every 20 minutes starting at 2pm and continuing until 4pm. On January 4th and 6th the guided visits at 3pm will be in English. We recommend you book your guided visit by emailing regalatiunrestauro@mercurio-italy.org. All proceeds collected during these guided visits will go Amici degli Uffizi to fund the restoration of a work of art from the Uffizi Gallery. 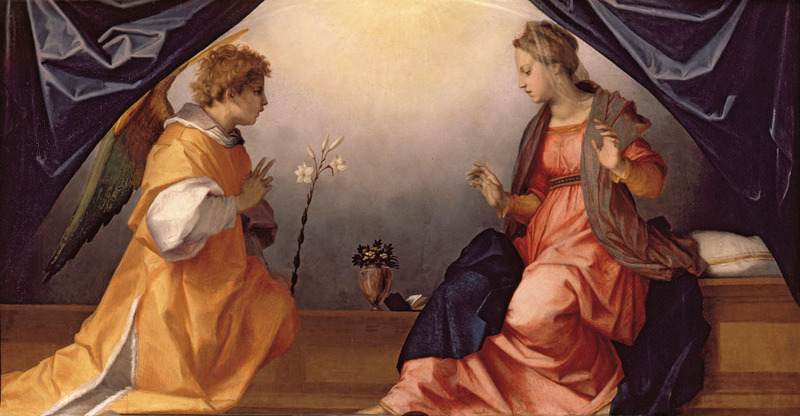 By pure fortunate coincidence, visitors to the Uffizi Gallery this holiday period (up until January 6, 2015), will have the chance to admire the masterpieces of the museum’s permanent collection but also 3 additional exhibits! For this reason, it is best to remind everyone that during the holiday season, the Uffizi Gallery will closed only on December 25th and 29th and January 1st, with a special opening on January 5th. Last days for the exhibition that was to end in November, extended until January 6. 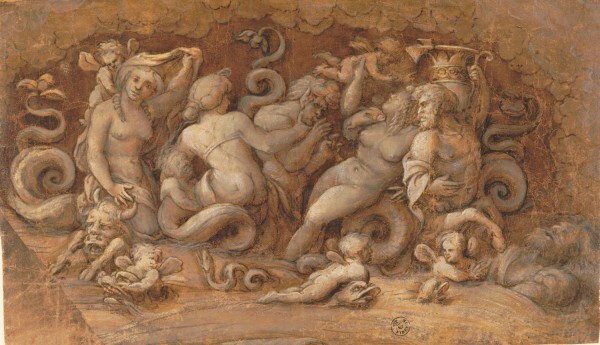 Until February 8th, in the Detti room in the Departments of Prints and Drawings within the Uffizi. What started as an online exhibit now allows the originals to be seen in this room, a selection of Amico’s 15th century drawings from the Department itself alongside those of a few contemporary artists from his own birth city to better understand the context in which he trained and worked in. With the use of his pen and diluted inks, colored pigments and white lead, Amico created broad strokes and outlines, vigorous crossed lines to create depth. You’ll be able to see Amico’s interest in the antique, his reflection of other masters of his time, including Michelangelo and Raphael, and the influence the circulation of prints from Germany had on his work. Along the walls of the Fireplace room, within the first floor of the Uffizi, you’ll find the photographic exhibit with views of museums from the turn of the 19th century. The Archive itself was founded in 1904, and some of the shots taken by staff from that office date back to this time. The exhibit documents how the museums have changed over 100 years, from how they have been set up to how they have promoted art and culute. We make note of a very special photograph: one from December 1913 that shows Leonardo da Vinci’s Monnalisa on exhibit at the Uffizi’s Self-Portraits Gallery two years after it was stolen from the Louvre Museum in Paris. Enjoy your visit and Happy Holidays!